Abbotskerswell, twinned with Le Pre d’Auge and Les Monceaux Normandy, is a picturesque Devon village full of history and character. Its position on a map can be deceptive. It is in a quiet valley, well away from the hustle and bustle of the larger towns and their roads but is conveniently located only 2 miles from Newton Abbot where there is a mainline railway with connections to London Paddington. Abbotskerswell has plenty of amenities including an active preschool and an excellent primary school, the renowned Court Farm Inn serving delicious home cooked food with a friendly welcoming and cosy atmosphere, a village shop, hair salon, beautician, veterinary centre, café / emporium, church dedicated to St.Mary and sports facilities including a recreation ground with football field, allotments, children's playground, tennis court and skateboard park. Situated in this idyllic setting is Marystowe, a beautifully renovated 4 bedroom Victorian country residence. Built in 1873, the property has been recently completely modernised and extended to a very high standard and now perfectly blends modern style and convenience with Victorian charm. The accommodation is arranged over two floors and retains many original features, including high ceilings, internal doors, cornicing and stained glass. 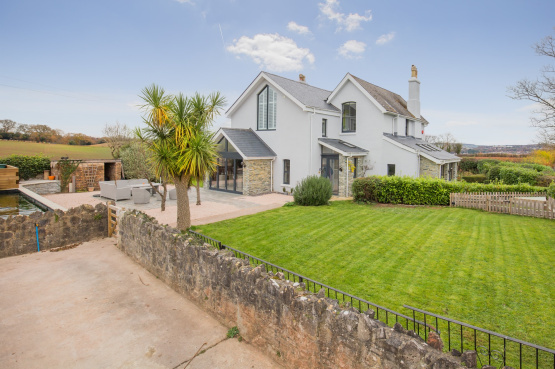 The double storey extension features vaulted ceilings and makes the most of the southerly aspect with bespoke windows, most noticeable in the master suite. Marystowe also benefits from a separate 1 bedroom annexe, with its own garden, that has been beautifully converted with reclaimed oak beams and feature stonework. Marystowe is offered to the market with a guide price of £825,000. For further information please contact Marchand Petit’s Totnes office on 01803 847979 or email: totnes@marchandpetit.co.uk.